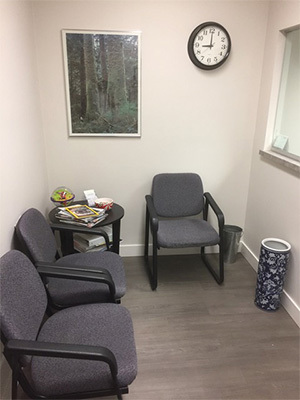 Pacific Massage Therapy Clinic located in Vancouver BC and is the home to experienced Registered Massage Therapists (RMT), most of whom have worked together for many years. For over 25 years the therapists at Pacific massage therapy clinic have been dedicated to relieving pain and enhancing health and well-being. Our therapists are highly trained in assessment and treatment procedures. They use a combination of techniques to treat both musculoskeletal pain and dysfunction and relieve stress promoting relaxation. We are situated at 750 West Broadway, Suite 718. We are located in the Fairmont Medical Building, between Heather and Willow Streets on Broadway. Street parking is available and there are many parkades in the neighbourhood. Our building has a parkade with meter parking. The clinic is open Monday to Saturday from 8am to 7pm. You can book and manage your appointments online from anywhere, at any time on any internet connected device! Simply click on the "Book Now" button and follow the prompts. For those who prefer, we will continue to take appointments by phone during office hours at (604) 872-1818. Lionel Webb, RMT, Teresa Koelewyn, RMT and Anu Lima, Registered Physiotherapist are available for online booking. To book with Suzanne Vetterli please phone in.